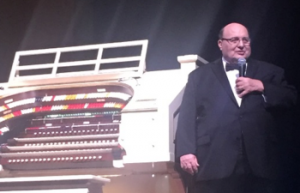 Scott Foppiano opened the 48th concert season of the Dickinson Theatre Organ Society (DTOS) on October 7. 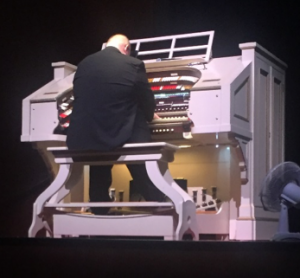 The Mighty Kimball, the world’s fourth largest theatre pipe organ, was up to the challenge as Scott delighted the audience with pieces from an array of genres. Scott referred to the Dickinson Kimball as a “world class, one-of-a-kind instrument.” This wasn’t Scott’s first appearance at Dickinson. He performed as part of the Christmas Spectacular in December, 2016. Scott opened up with Good Morning! from the 1937 musical comedy Babes in Arms (which featured Judy Garland and Mickey Rooney in the 1939 film). He followed that up with Our Love Affair, another Judy Garland / Mickey Rooney favorite from Strike Up the Band (1940). Switching gears to Italian Opera, Scott performed the beautiful aria Nessun Dorma from Giacomo Puccini’s Turandot, featuring the organ’s solo sounds of the reeds and the strings and the softer choruses, leading up to a full crescendo. Dancing in the Dark, a popular song with music by Arthur Schwartz and lyrics by Howard Dietz, was first introduced by John Barker in the 1931 revue The Band Wagon. The song was first recorded by Bing Crosby in 1931 with Victor Young and his orchestra. This piece beautifully showcased the abilities of a magnificent theatre pipe organ. Skylark, a 1941 jazz / ballad with lyrics by Johnny Mercer and music by Hoagy Carmichael, featured unique harmonies and chord progressions and the Kimball’s “little birdie,” used often in silent film accompaniments. Scott then offered a ballad-ish up-tempo toe-tapping Benny Goodman (1936) song, These Foolish Things. Changing gears once again, but this time to classical baroque, Scott played Arioso (Johann Sebastian Bach), featuring the Kimball’s beautiful lush, soft tones, strings, vox humana, and the string celestes. All of the chambers of the organ worked together to deliver this beautiful piece. Scott ended the first half with a medley from Rodgers and Hammerstein’s The Sound of Music. It’s like having an entire full piece orchestra, with all of the nuances, at your fingertips. The medley included The Sound of Music, My Favorite Things, The Lonely Goatherd, Do Re Mi, Edelweiss, Wedding March / Maria, 16 Going on 17, and Climb Every Mountain. 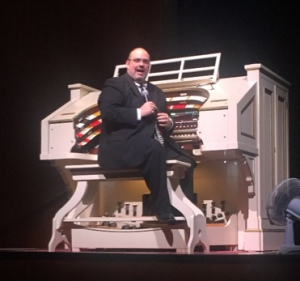 After intermission, President Bob Dilworth welcomed the audience back as Scott began the second half with the 1936 Goody Goody, followed by O Mio Babbino Caro (Oh My Beloved Father), from the opera Gianni Schicchi (1918). Next up was a 1930 upbeat Walking my Baby Back Home, offering atypical registrations and featuring the stage piano. The blended sounds using the Kinura and buzzy reeds gave the piece a very British charm. My Heart at Thy Sweet Voice, a piece from the 1877 opera Samson and Delilah written by French composer Camille Saint-Saens, was a real “heart-tugger,” highlighting the soft, individual tones, string choruses, and featuring a triumphant build at the end to full organ. One of my personal favorites from the night was a medley from the 1956 (Lerner / Loewe) Broadway hit My Fair Lady, featuring You Did It, On the Street Where You Live, Wouldn’t It Be Loverly, I Could Have Danced All Night, With a Little Bit of Luck, The Rain in Spain, Ascott Gavotte, Get Me to the Church on Time, I’ve Grown Accustomed to Her Face, and Show Me. Here’s one that not many have heard before – Beyond the Rainbow, by Leroy Shield, who composed the theme from “The Little Rascals” and the background music for Laurel and Hardy. Scott ended his concert with the Coronation March, a “classical barn burner,” as he called it, from the 1862 opera Le Prophete (The Prophet) by Giacomo Meyerbeer. As an encore, Scott offered Pietro’s Return, written by the “Daddy of the Accordion,” Pietro Diero (1919). Members of the audience enjoyed the opportunity to meet and interact with Scott at the on-stage reception immediately following the concert.